We are finally announcing the closing of Gasworks Park Kite Shop. The building we are in is going to be torn down- a good reason to retire after 33 years. We are targeting July 31 as our last day. In our family, buying and flying a kite is a childhood rite of passage, and having a kite shop conveniently located next to Kite Hill made that tradition all the sweeter. I’m sad to see them leave the neighborhood, but wish them a very happy retirement! In 1980 the mother and son team of Kathy Goodwind and Todd Hostetter moved the operation to the North Lake Union area of Gasworks Park where Mayor Royer declared ‘Kite Hill as the official kite flying area of Seattle. Now there is kiteflying all over Seattle at Golden Gardens, Magnusson Park, Carkeek Park or Discovery Park. Gasworks Park Kite Shop has been in 5 different homes since moving to the area. 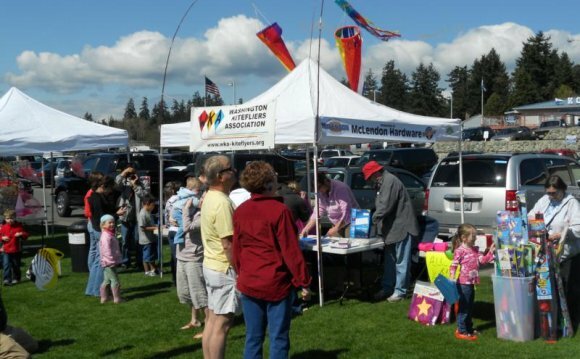 We produced the Seattle Kite Festival for 12 years where thousands of people gathered to watch kites and banners flow in the wind. At our retail outlet location, 3420 Stone Way North, Jennifer and Eric teach people how to have fun outdoors. We carry toys as well as kites. Whether flying a kite, tossing a disk or juggling balls, lunastix, diabolos, or yo yos, they make a sure customers leave happy. If our customers cannot make it to our store we have provided this website to give customers an idea of the products we carry. All customers need to do is pick the product they desire, place it in the shopping cart and we will send the purchase post haste.